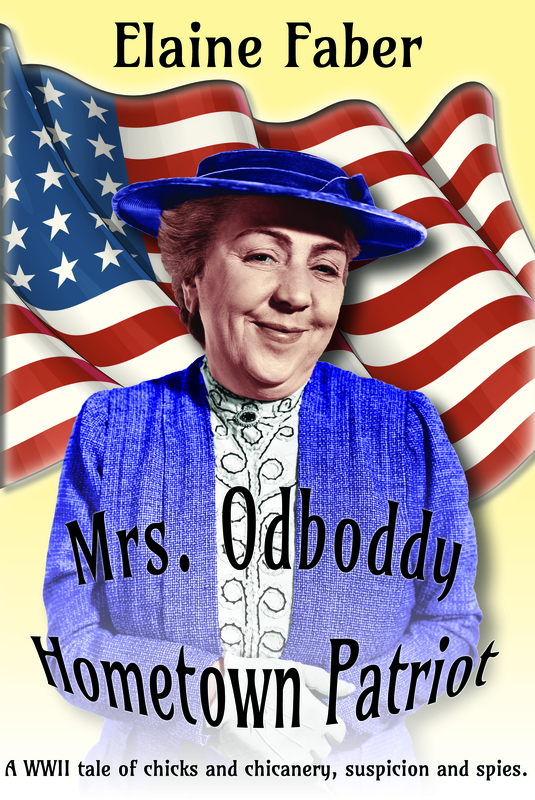 This hysterical, historical novel is set during WWII and elderly, busybody Mrs. Odboddy considers herself a hometown patriot, fighting the war from the home front. Having served as an under cover agent during WWI, she assumes that the homeland has Nazi spies as well as conspiracies that must be routed out and she's the one to do it. Knitting sox for the soldiers, collecting cans and newspapers, serving cookies at the USO, and keeping watch at the coast watchtower for enemy invaders keeps her plenty busy. Imagine her surprised when her old WWI lover shows up with romance on his mind. Distracting as he may be, he doesn't keep her from solving what she believes is a ration book black market conspiracy or coming to the aid of Mrs. Roosevelt when she comes to town. Toss in several lesser known historical events and a romance with her lovely red-headed granddaughter and the town doctor, and you have a rollicking novel that will keep you laughing. (and a fourth to be published soon. Let’s pretend for a minute, we’re an author considering writing a new cozy mystery series. What is the secret of a successful cozy mystery series? After careful analysis of numerous successful cozy mystery series,’ we begin to notice a certain template to the storyline of each novel. If we follow this template of success, our story should begin with a beautiful, blonde, female sleuth, recently divorced with, or without child. She must have a dog or a cat to capture the hearts of animal lovers. The pet doesn’t have to solve crimes, but it helps. Her sweetheart, (who likely resists a committed relationship) is connected to an inept police department, which gives her access to official information and documents generally withheld from the public. She must have a quirky friend, either of another race, gender or combination there-of. She also needs an unusual profession or hobby. The best jobs or hobbies have already been snagged by other popular mystery series’. These include book store owners, catering services, dog groomers, travel agents, writers, pet sitters, private detectives, cruise ship directors, bakeries, college professors, librarians, etc. For any hope of a successful series, she’ll need a career that hasn’t been done to death, but one that gives her access to plenty of potential murder victims or crimes. It is a series, remember? She will need lots of suspects. In the end she must succumb to temptation and make terrible judgment choices and at the last moment be rescued by her boyfriend. We begin the cozy mystery template. Let’s have our potential sleuth own her own septic tank truck giving her access to plenty of overflowing back yards where she is able to spot various, nefarious ‘going’s-on’. The lady septic pumper-outer and her quirky sidekick find a body in the pump house. Proceed to red herrings, unrequited love, and suspicious characters. Sadly, all have alibis. Toss in some plumbing trivia, stopped up toilets, (a humorous scene or two involving overflowing toilets, or embarrassing bathroom scenes) and move right on to the climax where our heroine agrees to meet the Home Depot plumbing salesman in the plumbing warehouse, but neglects to tell anyone where she’s going. This is vital to any cozy mystery, a must-be-included situation. The killer-plumbing salesman strings her up to the rafters, because she’s ‘flushed him out.’ Her death is imminent. However, her dog (or cat, raccoon or gerbil), tracking her scent, leads her detective boyfriend, having finally realized his true commitment to her, to the warehouse. He arrives just in the nick of time. The killer is apprehended, every toilet is unstopped, and the heroine rides off into the sunset in her sewer truck. This is a sure-fire formula to a red-hot New York best seller. Several folks have suggested I write this novel, and, stay tuned, I just might do it. The flagman flipped his sign to STOP. John stomped his brakes. 9:50 A.M. Why hadn’t he left sooner? Work delays along the mountain highway between Nevada City and Reno were not unexpected this time of year. John’s throat tightened. He had to get his Emu hatchlings to the airport by 12:30 P.M.! If they missed the flight, what could he say to his buyers? “Yeah! You trusted me, but I didn’t account for delays, so we missed the plane.” If he lost the sales, like dominoes, he could lose everything. His ranch–his business–even lose the custody of his daughter. Traffic crept forward. Another flagman. John whacked the steering wheel. “Let’s go!” Perspiration beaded his forehead. They have to fix a landslide today. I have to make the flight in time. Lord, show me the way. Another road worker stopped traffic. John’s truck inched forward and came to a stop beside a hitch-hiker. What was a hitch-hiker doing on a mountain road so far from Reno? The hiker caught John’s eye and extended his thumb. John unlocked the door. “Get in.” What did he have to lose besides his money or his life? The hiker dropped his backpack to the floor and slid into the truck “Thanks. I’m Peter.” He needed a haircut and a shave. His jacket was frayed and stained with perspiration. Oddly, his fingernails were clean and trimmed. The cars crept forward. John checked his watch. “I’ve got a plane to catch at 12:30 P.M. If I miss the flight, I’m cooked.” He jerked his head toward the chicks in the rear. “You don’t understand what’s riding on getting my chicks on that flight.” John waved toward the flagman. John shrugged. “If you say so.” The cars inched forward. 10:22 A.M. Just over an hour to make the flight. “By the way. Do you know your Bible?” Peter asked. Before long, they were in the valley with traffic moving along at normal speed. Peter waved and trudged up the driveway. John’s truck kicked up dust as he turned onto the dirt road. “Wait!” Peter’s backpack lay on the floor! He hit the brakes. Why hadn’t he taken it when he got out of the truck? "There’s just enough time to get to the airport. If I go back, I might miss the flight. But, it’s all he owns… I have to go back.” John turned the truck, raced back down the dirt road and turned into Peter’s uncle’s driveway where he spotted a woman watering flowers. The woman shook her head. “Not in my driveway.” She backed toward the house. “Sorry. I must be mistaken.” Back at the road, the red marker flapped on the pole. This was the right place. John unzipped Peter’s backpack to look for a phone number or an address…. He pulled out underwear, toothbrush, a notebook. A paper fell from in John’s lap. Lightning slashed overhead. Dark clouds gathered beyond the foothills. There’d be rain by nightfall. John glanced at his watch. 11:15 A.M. .There was just enough time… time to get the chicks to their flight. Maybe he’d even get home before the storm hit. Rolling thunder drowned out the clanging church bells across the street. Lightning zig-zagged across the sky. Fear clutched my heart as Mother Nature crashed around me. Was this reality, or had I been caught up in a time warp that transported me to another place–magical, ethereal, and terrifying? Stay calm. It’s just a sudden summer storm. A torrent of water rushed down the Austrian cobbled street, threatening to overflow the gutters onto my feet. Were the bells warning of some disaster? Had war been declared? Had someone assassinated the President? Did Austria even have a President? I was pleasantly amused, but did not wish to dispute his quaint belief in the magical power of the bells. As we talked, we stood shoulder to shoulder. His scent comforted me–a woodsy manly scent, strong and secure. The rain stopped as he released my hand, waved a final farewell and strode toward the train. As he disappeared into the station, the blare of marching bands…became the tinkling bells around the cow’s necks in a nearby field. A final streak of lightning…replaced the image of fireworks in the night sky. The sun came out…and cast sparkling rainbows through the dewdrops dripping from the awning. The whistle blew and the train clacked down the track. The magic spell was broken. Was it a crack in time and space? Was it an entire lifetime of love that two strangers shared in those few moments, or was it just a dream caused by the magic of the bells and the storm clouds? Years have passed. I’ve had the best life one could hope for–marriage, a satisfactory career, and children. But, every time I hear church bells, I close my eyes and remember a summer storm in a faraway land. If you enjoy this short story, please check out my published novels on Amazon. 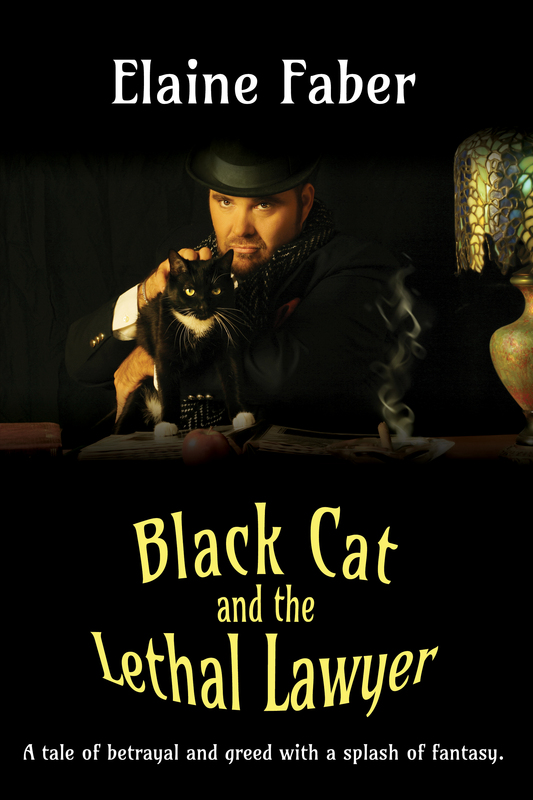 Black Cat's Legacy, Black Cat and the Lethal Lawyer, Black Cat and the Accidental Angel, Mrs. Odboddy Hometown Patriot, Mrs. Odboddy - Undercover Courier, Mrs. Odboddy And Then There was a Tiger, and All Things Cat (short story collection about cats). Shoko – InterviewerSurmising a rodent intruder in the package, I promptly extricated said rodent by tooth and claw, thus eliminating smelly threat level to zilch. (a) Did you kill that thing in the package? 2. Does Mrs. Odboddy's antics ever get in the way of her feeding you on time? Or providing you with enough attention? Mrs. Odboddy knows better than to neglect my head scratches. But, on rare occasions, when Mrs. O. doesn’t come home at night, I must rely on others to provide my victuals. 3. What is it like living with an eccentric old woman who 'fights the war" from the home front? What makes her a hometown patriot? Feeling compelled to expose conspiracies and spies, and her multiple volunteer projects, Agnes is often away from home. Her amusing tales ‘after the fact’ almost makes up for it, though she is prone to stretch the truth when it puts her in a better light. 4. 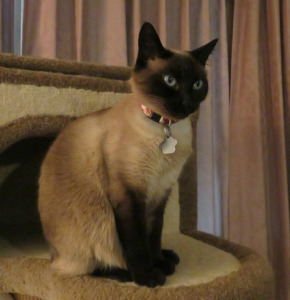 Since we are both Siamese, we sort of look alike. Is it possible we are related? Descended from royal blood myself, it is doubtful that we are related, though I suppose it is possible. Have you done a DNA test through Ancestry.com yet? 5. When your former mistress, Lilly, is released from Japanese Internment camp, will you go back to live with her or stay with Mrs. O.? Agnes assured me that after the war when Lilly comes home, I will remain here. Now that I’ve blessed their home for some time, I’m sure Agnes would miss my sparkling personality and humble nature. 6. If Mrs. Odboddy can't find a home for the tiger, Shere Khan, any chance she'll bring him home to live with you? How do you feel about that? Oh my stars! It’s one thing to bring a homeless cat into one’s life, but I don’t think Shere Khan would fit in our bed. I don’t plan to give up my spot any time soon. 7. 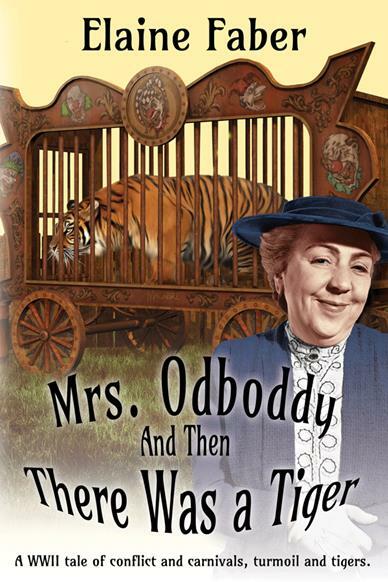 Which of Mrs. Odboddy's three published books is your favorite? My biggest role was in Hometown Patriot (http://tinyurl.com/hdbvzsv), so I suppose that’s my favorite. When Mrs. O put six chickens in the bathroom, I did a pretty good job of messing with that project, if I do say so myself. MOL!!! 8. 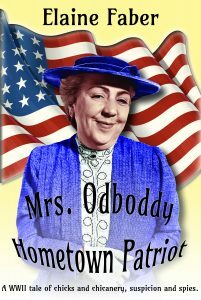 Should an elderly lady like Mrs. Odboddy have a boyfriend? Do you want her to marry Godfrey? How would you feel about calling Godfrey…”dad?” Every old lady should have a boyfriend, or a ‘friend-boy,’ as the case may be. Godfrey’s pretty cool but Mrs. O will never marry him. She’s too set in her ways and I expect Godfrey would cramp her style. 9. Why does Mrs. Odboddy keep getting in trouble with Chief Waddlemucker? Because she can’t keep her nose out of everyone’s business and the Chief often gets in the way of her shenanigans. In spite of it all, they are still friends. 10. What can you tell us about Mrs. Odboddy as a secret agent during WWI? Does she still consider herself a secret agent? If I told you all I know about her WWI activities, I’d have to kill ya’. Without a doubt, she’ll never stop tracking down Nazi spies and wartime conspiracies, even though I’d prefer her home scratching my head or knitting! Oh my! There she goes again, and it’s time for my dinner. 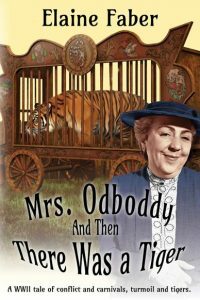 Check out this and the two other Mrs. Odboddy books available at Amazon $3.99 ebook. In the early 1980’s, when my kids were young teenagers, we had to close our business, leaving us in considerable debt. Collection agency calls were daily occurrences. One month, I had to pay my house payment with the Visa card. We gave up a 1972 Cadillac convertible to settle a business obligation. The IRS emptied our meager bank account (without notice) to pay the overdue California sales taxes, resulting in bounced checks all over town. These days we would say we were financially challenged. We said we were "broke." No way was there extra money for a Christmas tree. My husband brought home a beautiful manzanita branch, mounted it on a base and decorated it with red Christmas balls. Not the traditional Christmas tree, to be sure, but pretty. We set our few presents underneath. Hubby and I were prepared to deal with the substitute tree, trusting that things would be better next year. The kids hated it, calling it the Christmas Stick. They were embarrassed when their friends, who had lovely trees with presents, came to visit. We muddled through that financial disaster, took a second mortgage on the house at 14% interest (true) and paid off all the debts. Over the next few months, we borrowed from a family member to pay off the mortgage and by the next Christmas, we were back on our feet. The kids had toys and we had a real Christmas tree. I was thinking the other day that sometime in our life, we should all have a Year of the Christmas Stick. A year when we can’t afford to buy the children expensive gifts that break before New Year’s Day. A season where we do without the luxuries we’re used to: Christmas trees, lights in the front yard, presents and expensive holiday outings. A year when we walk in the footsteps of folks out there, by virtue of unemployment, natural disaster or illness, who are without a tree and without gifts. For that matter, maybe some are even without a home with a chimney for Santa to slid down, such as this year, following the dreadful fires in L.A. and northern California. It’s been over fifty years since the Year of the Christmas Stick. This Christmas Day, as our family stumbles from the table loaded down with ham and cookies and all the fixings and we gaze at our ten- foot- tall Christmas tree with gifts piled high,we might remember the Year of The Christmas Stick and it's humbling message. We are grateful for the important things. We are blessed with our families, our health, our faith, all gifts from God. We remember to share our bounty with those who are in need. We remember that there are some folks who might think they were blessed to have a Christmas Stick with a few presents underneath, even if it was just sweaters and pajamas and sox, like my kids got that one Christmas so long ago. I remember how hard things were when we closed the business and struggled to make ends meet, wondering how we could make good on our business debts, keep our home and feed our kids. We struggled and persevered and made do with a manzanita branch for a Christmas tree. Looking back, I remember and can't help but thank God for the opportunity to experience the Year of the Christmas Stick. We all learned lessons that I hope we will never forget. Anthony crouched next to the telephone booth behind the Rescue Mission. He pushed back a strand of dirty hair and wiped a ragged sleeve across his nose. He was sick of hot dogs and beans at the Rescue Mission and their phony Christmas spirit. He hated the sight of plastic Christmas trees, fake Santa’s and the city’s hollow Christmas cheer. Several months had passed and none of his plans had worked out. Without a high school diploma, he couldn’t find a job. Without a job, he couldn’t even rent a room, and the car he wanted? A pipe dream. He shivered in the cold and pulled a wallet and ring box from his pocket. Now, look at me; a common thief, homeless and hungry. What a fool I am. I want to go home. Anthony counted the money in the wallet$267. The glow of the light pole glinted off the diamond in the platinum engagement ring. Was it enough? Maybe with the stolen money and if he pawned the ring, it would be enough for a bus ticket home…All the way across country. But, what if Mom and Dad turned him away? What if…? Anthony stepped into the phone booth and dialed the familiar number. The phone rang three times. “Hello?” His mom’s voice... So warm, so reassuring. Would she…? “The kid stepped out of the shadows. It looked like he had a gun in his pocket. He demanded money. I gave him my wallet and then he said, ‘Empty your pockets,’ almost like he knew I had something more. I didn’t want to give up the ring, but he kept jerking his hand, like he was gonna shoot. I took out the ring box and he snatched it and ran. I just stood there like an idiot. I thought I was going to die.” Mark knuckled his eyes. Mark pulled her into an embrace. It’s my own fault. I shouldn’t have gone into that neighborhood after dark. The bell over the shop door tinkled when a portly man entered the neighborhood pawn shop the next afternoon. He glanced around the shop and walked straight to a glass case filled with rings and watches. An elderly man stepped through the curtain in the doorway into the back room. “Afternoon.” His head dipped in greeting. “Help ya? In the market for somethin’ shiny?” His eyes danced in expectation as he ran a hand over his week-old bearded chin. George held the ring up to the light. “I’ll take it.” He pulled a bundle of bills from his Warehouse for Stout-Men’s breast pocket, counted out nine twenties and laid them on the counter. “$180 cash. That enough?” He raised an eyebrow. “Sure great doin’ business with an honest man.” The doorbell tinkled overhead as the cold air struck George’s face. He stooped into the wind and walked away. He shook his head. “I’m not gonna buy some dumb dress. I bought you something nice this afternoon.” He reached into his pocket and drew out the silver ring box. “Oh, Georgie, for me?” Lisa’s eyes glittered as bright as the diamond inside the box. She slipped the ring on her finger. “Oh, it’s beautiful. Now we can get married. Let’s drive to Reno tomorrow! Can we, Georgie?” She touched his cheek and drew his face down for a kiss. Her face crumpled. George put his hands on her shoulders. “Hey! I’m sorry. You know I love ya’, Baby. Give me a kiss. Aren’t you my fi-ance’ now?” Lisa wrapped her arms around his stout middle and tilted her head for a kiss. George’s lips barely grazed her forehead. He looked around to see if anyone was watching. The shoppers on the sidewalk scurried past without a glance. “Listen, Baby. I got too much going on right now. I hadn’t exactly thought about getting married so soon. Can’t you be my fi-ance’ for a year or two–? Lisa’s face paled. She pulled off the ring and shrieked, “Just as I thought. The only reason you bought me a ring was you figured it would keep me quiet. Well, it won’t work, George. I’m not waiting a year or two, or a month or two! We’re through!” Lisa pitched the ring into the street where it disappeared under two inches of snow. She whirled and ran down the street, waving. “Taxi!” Lisa jumped into a passing cab and before George had time to catch his breath, the cab turned the corner and disappeared. Within minutes, two policemen had George handcuffed and headed for the station, under arrest for disturbing the peace. Christmas morning, George was released after a thorough psychiatric consultation determined that he was no risk to himself or society. In the next cell block, the pawn shop owner was being booked for selling stolen property, the result of an undercover sting operation…. Outside of town, a flock of crows huddled in a tree near a hill where children swooshed through the snow in new, bright-re Christmas sleds. Roused by the children’s laughter, a crow rose up and swooped over the treetops, across the town square and landed on the warm metal roof of Macy’s Department Store. As the sun melted the snow, the crow spotted something glittering in the street. He swooped down and picked up the bright object, flew over the park and past the church parking lot where Mark and Martha were walking with other parishioners after the service. Attracted by the crowd, the crow circled back. Now, his attention was caught by a shiny gum wrapper tossed out a car window. The crow dropped the ring and dove for the silvery paper, picked it up and flew away. The ring plummeted down and landed at Mark’s feet. He leaned down. “What on earth?” Chill bumps raced up the back of his neck. “Why, it’s Mom’s engagement ring…! How on earth…?” Mark turned and looked up. The sky was empty except for a crow, flying away with a shiny gum wrapper in its beak. “It’s like it fell from Heaven. It’s a miracle!” Mark slid the ring on Martha’s finger and pulled her into his arms. Eighteen hours later, Anthony peered wearily from the window as the bus pulled into an Omaha bus terminal. Will they forgive me? Will they let me stay and go back to school? Maybe I could work in Dad’s store and earn my room and board. A book review by Thumper, the cat with the memories. Thumper’s the name. We just got to Grandmother’s Texas ranch and I met this babe…a cream tabby vixen with eyes the color of mustard and stripes the color of marigolds. Yowza! It was love at first sight. After a brief courtship and an ‘understanding,’ Noe-Noe and I were hanging out by the river where we overheard Grandmother’s lawyer and the stable master talking. Seems the lawyer was upset that Grandma plans to change her beneficiary from the Children’s program he sponsors to either my person, Kimberlee, or her cousin, Dorian. Worse yet, he intends to kill Grandmother. Well, let me tell you, it was enough to twitch the whiskers off a striped skunk! Noe-Noe and I vowed to keep the old gal safe, even though Grandmother’s reason for bringing the family to Texas isn’t the sweet family reunion she claimed. She has an ulterior motive to destroy Kimberlee’s family. In spite of Grandma’s wicked agenda, Noe-Noe and I agreed we had to protect the old biddy. She is family after all, and isn’t it every cat’s duty to protect his family? What happened to our fun-filled family reunion? Grandma’s on a roll to disrupt Kimberlee’s life. The attorney plans to kill Grandma and now we’re suspecting the stable master is hiding a secret identity! It’s turned into a series of cat-astrophies that shouldn’t happen to a dog. Speaking of a dog, cousin Dorian brought her dog to Texas, too. When Kimberlee took him for a walk out on the desert, she almost stepped on a rattlesnake. Yikes! Good thing I wasn’t with her. I’d rather face a killer any day of the week. A rattlesnake? …not so much. If I was of a mind, I could clue you into what’s behind some of the mysteries around here. If you read my first book, Black Cat’s Legacy, you already know that with the aid of my ancestors’ memories, I helped Kimberlee solve some of the Fern Lake mysteries. Same thing here in Texas. There’s the stable master, for instance. Thanks to my great grandfather’s memory, I know that he was involved when Kimberlee’s father was murdered. And, what about Grandmother’s sinister plot with regard to Kimberlee’s little girl? Things are going from bad to worse and there’s only so much a cat can do. Elaine Faber’s short stories have appeared in multiple magazines and fourteen anthologies. She is a member of Sisters in Crime, Cat Writers Association, and Northern California Publisher and Authors. 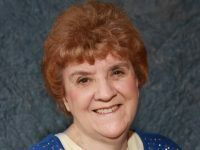 Elaine enjoys speaking on mystery panels and book signing events. 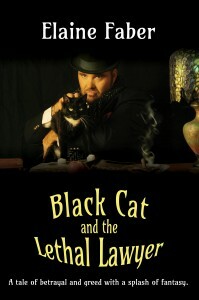 Black Cat’s Legacy and Black Cat and the Lethal Lawyer are light romance and cozy cat mysteries. who with the aid of his ancestors’ memories, Thumper (Black Cat) helps Kimberlee solve the mysteries. The third book in the series is Black Cat and the Accidental Angel. Balaam answers, “Because you won’t obey. If I had a sword, I’d kill you!” Finally he sees the angel who delivers God’s message and Balaam obeys. (Loose translation. )##The amazing thing is that Balaam wasn’t the least bit amazed when his donkey spoke aloud to him. Instead, he argues and curses the donkey. Something to think about…But I'm quite familiar with other talking animals. (See my three cozy cat mysteries where Black Cat narrates a good deal of the story). DO WE STILL BELIEVE IN ANGELS? In the US, a 2008 survey polled 1,700 respondents, and found that fifty-five percent of Americans, including one in five of those who say they are not religious, believe that they have been protected by a guardian angel during their life. Thousands of personal accounts have reported interactions with angels. DO OTHER RELIGIONS BELIEVE IN ANGELS? Angels are part of many religions including Christianity, Islam, and Buddhism and are mentioned in the Bible as well as in the Qur'an and Hadith. All religions agree that angels are divine spiritual beings sent by God as messengers to comfort, or to protect in time of great need. Whatever success you’ve achieved in business is likely due to the help of many people who mentored and helped you. Now you can be someone’s angel by mentoring, helping and encouraging others. Angels lend a helping hand in time of need. Who knows? The person you meet on any particular day may need an angel. Or…he may BE an angel. Donkeys can be stubborn and contrary. Sometimes they hold back when they should move forward. It’s your choice. Donkey…or angel? Papa Red Warty Thing was right. The urge to see the world was strong in the most adventurous Cucurbita Pepo in the community. Unlike his more obedient and littlest cousins, Baby Boo, Wee-be-Little, and Jack-be- Little, who never strayed past the first twist in the vine, Harvest Jack was determined to see more of the world than the front and rear end of his closest relatives. Harvest Jack’s cousins gasped in horror. Such disrespect! Such defiance! Unheard of in polite Cucurbita Pepo society! They turned away from the disobedient cultivar and buried their tendrils and stem under their prickly leaves. Sweet Sugar Pie waved her sticky leaves in dismay. “Don’t even think such a thing. My family has a proud history of becoming harvest pies for the past 72 generations. Grandma Sirius Star would roll over in her mulch if she heard of such a vulgar future for one of our clan. I know that some of the Rock Star and Howden crew across the field plan to be gutted and carved up. Some even look forward to having lighted candles stuck where their innards used to be. That’s not the future I want for our boy.” A drop of morning dew trickled from her stem, down her rounded middle, and plopped into the dirt. Papa Red Warty Thing was wrong, for by now, Harvest Jack had wandered into the road and lay directly in the path of the giant tractor grinding its way down the road, swooping up all in its path, and dumping the unfortunate ones into a hopper to be carried off to an uncertain future. Harvest Jack heard the engine and turned toward the sound. “Uh Oh!” The seeds in his belly shook in terror. Papa Red Warty Thing was right, after all. He was about to be crunched into a fritter and there wasn’t anything he could do about it. How fool-hardy he had been. How he wished he was back alongside little, white, cousin Baby-Boo, or little cousin Wee-be- Little’s tiny, orange body. Their future was assured. They would become cute little decorations, perched alongside a costumed vampire doll in the middle of a mantle, or maybe in a wheelbarrow surrounded by harvest leaves and acorns and a couple Rock Star or Howden’s. Even his distant cousin Lil’ Pumpkemon with his white body and orange stripes might end up on the front porch with his larger relatives. It appeared that Harvest Jack, on the other hand, was going to be smashed flat and ground into pulp by the tractor tires. Suddenly, Harvest Jack felt himself lifted from the dirt. Guttural, humanoid sounds reverberated through his stem and then he felt the cool, earth beneath his bottom. What had happened? He found himself lying just inches from Papa Red Warty Thing and Sweet Sugar Pie. Somehow, he’d escaped the wheels of the tractor and was back in his very own field. How warm and good the sun felt on his face. “You can, my dear, but you can’t be cherry pie, because you’re a pumpkin.” Papa Red Warty Thing patiently explained. 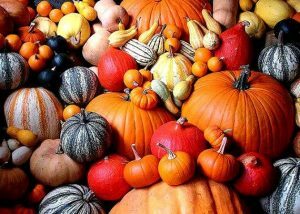 All the critters names are varieties of pumpkins.